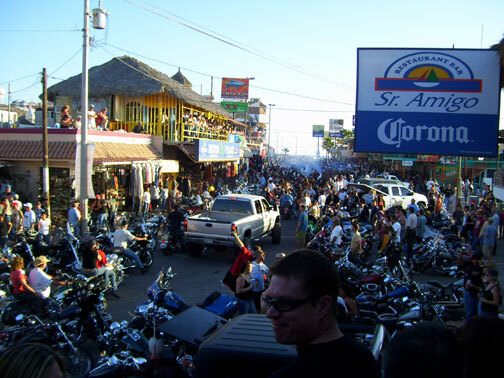 Thousands of motorcycle enthusiasts converged on Puerto Peñasco, Mexico (Rocky Point) from around the world for the 8th annual Rocky Point Rally on November 6-9, 2008. The bike rally showcased a variety of two, three and four-wheeled vehicles with demonstrations, contents, parades and parties. The Rocky Point Bike Rally, also called el "Gran Fiesta de Motocicletas," ("The Grand Party of Motorcycles"), is always held during the Veteran's Day weekend. 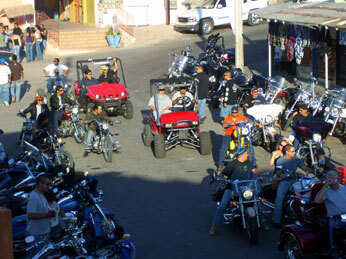 The bike rally is also an annual charitable event held in Puerto Peñasco (Rocky Point), Soñora, Mexico. Find out more about the local Mexican organizations supported through proceeds from the event. While fewer people attended the 2008 Bike Rally, it was still well attended considering the economic conditions. If you attended the rally this year, or plan to attend the 2009 Bike Rally, new photos and videos, plus event information will be posted. Send your Bike Rally comments and feedback to [email protected]. At this time, no passport or visa is required to visit Rocky Point. Instead, a valid driver's license AND a copy of your birth certificate is necessary. Border travelers may be required to present a passport beginning in 2009 or later. The wallet size passcard is also now accepted at the international border for citizens to enter the U.S. More US border travel details. The weekend 2008 bike rally included numerous sponsored and unsponsored spontaneous, events, parades and exhibits of metal, wheels and burning rubber, including the traditional Poker Run to Rocky Point, RideNow Invitational Golf Tournament and "Party On the Point." The event listings were updated as new information is received. Find more about this years 2008 Bike Rally Events. Hotel rooms and beach house rentals sell out fast. The slowing U.S. economy has virtually stalled several new hotel and resort developments in Puerto Peñasco and surrounding areas, so many rooms that were expected to be available are still partially constructed. Plans for hundreds of new hotel rooms have been on indefinate delay since 2007. For 2009, people will booking their stay in late spring to avoid sleeping with the wolves or the urchins. Find beachfront Rocky Point hotels for your stay from Travelocity and other online travel sources. Take a virtual tour of some of the highlights of the 2007 Bike Rally during Saturday's street parade down Puerto Peñasco's main street along the waterfront. Watch video clips and camera shots of some of the action downtown during the 2007 Rocky Point Biker Rally. Photos and videos from the 2008 RP Rally are being prepared for posting soon. Puerto Peñasco dining, map, hotels, and other entertainment. Full duplex communication between driver and passenger. Soft touch electronic volume control. Noise canceling microphones with Wind Block circuitry. Voice activated radio mute. Easily connects to optional FRS/GMRS radios and Cell Phones• . Product Dimensions: 12 x 9 x 2 inches ; 11.7 ounces. Shipping Weight: 1 pound. Note: Warranty does not cover misuse of product. © 2008-2009 EMOL.org / Entertainment Magazine On Line / AZentertain. All rights reserved. We carry the largest selection of riding helmets, jackets, pants, and even heated gear for colder seasons. Save on great Camping World products. Check out our new coupons! Stuck in the woods? Make it fun! Cool Bar Supplies and Equipment only at KegWorks.